Soup, what a weird thing to always be yappin' about, right? But alas, here I go again. Now that it's cold outside, I make it at least twice a week for dinner so you could say that I'm beginning to perfect my Fall list of Favorite Soup Recipes. This particular white chili above has taken the lead as far as white chilis go. It's hearty and packed with flavor, and like most other soup recipes, you can sort of just eyeball the ingredients and throw in whatever extra you have on hand. Yum, looks almost exactly like my white chili! I add chicken sausage too, though. I think I need to put that on the menu for an easy pre-Thanksgiving dinner next week. Yum! I will definitely be making this soon!!! Once I find a recipe I love for something I am always nervous to try another one! But this sounds so good! Thanks for the recipe! 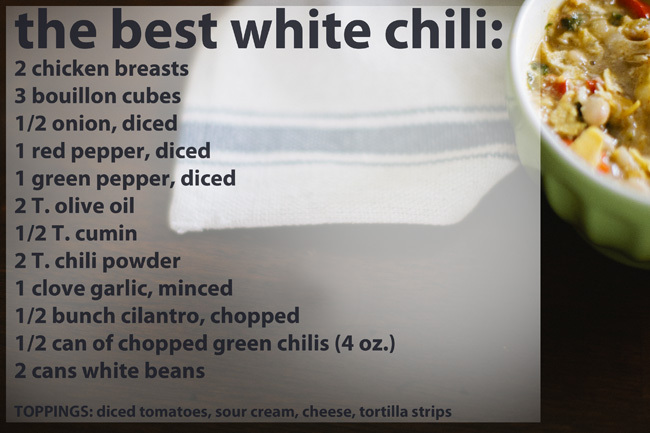 Here is the chicken chili recipe I got from a friend a few years...it's SO good too! cook in a crock pot on low all day! serve with tortilla chips + enjoy! we made this tonight! (I pinned it a while ago) It was so delicious - thanks for the recipe! !